Figure 1. 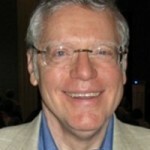 Jungian Analyst John Beebe. The Eight-Function Model (aka Eight-Function Eight-Archetype Model) is a depth typological system originally devised by Jungian analyst John Beebe (Figure 1). The model is predicated on eight archetypal principles that correlate to the eight function-attitudes described in C.G. Jung’s book Psychological Types. 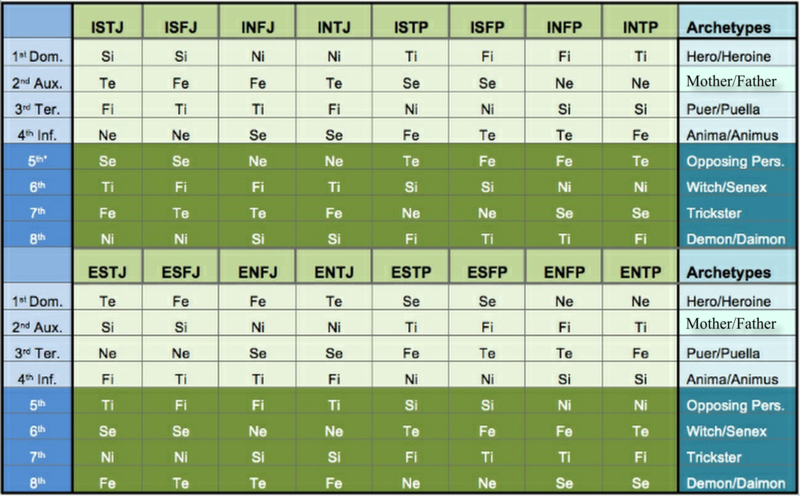 Beebe suggests that each of the four preferred functions of the Myers-Briggs© model is “shadowed” by its opposite function-attitude in the psyche. Beebe figured that the remaining four function-attitudes were still operative within the personality and thus should be included. Thus, the eight-function model is comprised of two quaternities which Beebe calls the ego-syntonic and the ego-dystonic personalities. 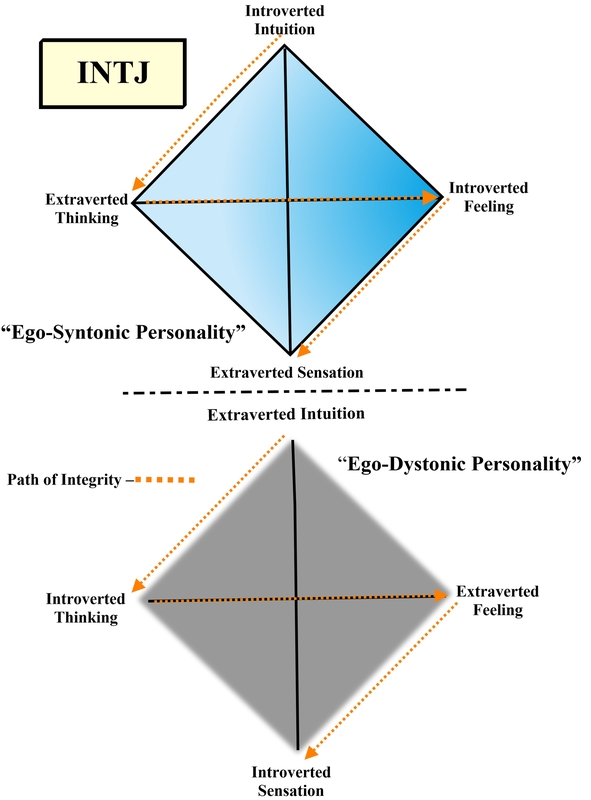 Whereas the ego-syntonic personality comprises an individual’s basic conscious orientation, the ego-dystonic personality could be viewed as a shadow cast by the conscious mind. Each quaternity consists of two axes of consciousness, the spine and the arms. The spine makes up the backbone of the superior and inferior functions whereas the arms suggest how the individual engages with the inner or outer world (i.e., auxiliary and tertiary functions). Alternatively, one could say that the spine axis oversees the personality’s relationship to the greater whole or what Jung called the archetype of the self. On the other hand, the second axis, the arms of consciousness, facilitate our relationships with other people. If the arms are rational, then the spine will be irrational and vice versa. According Beebe (2006), the function-attitudes “are carried into consciousness on the backs of archetypes” (p. 40), thus suggesting a sequence of eight functions for each of the sixteen types and each position within the schema carries the emotional energy of a particular archetype (Figure 2). Beebe drew the names for seven of the eight archetypes from Jung’s work, while the eighth, Opposing Personality, is his own term. The sequence does not imply any chronology of development, nor even gradations of consciousness, although functions in the higher positions (i.e., first quaternity) tend to be more accessible to consciousness. Beebe’s model further suggests that archetypal complexes guide type development within the personality and serve as guideposts of the individuation process, which fosters a more integrated and whole personality. Beebe (1992) has referred to the goal of this process as “integrity,” which he describes as a “dynamic participation in the needs of the whole” (p. 32). 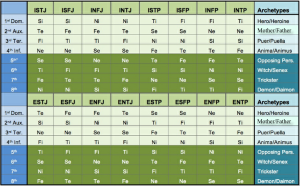 One could say that each archetype represent personified complexes that are usually unconscious within the personality. 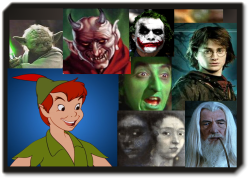 These personifications represent different aspects of the personality and thus possess a specific typology. Jung (1940) has suggested that there are traces of personalities in the manifestations of the unconscious” and that “The unconscious personates” (p. 16). Elsewhere, William James suggested that all thought tends toward the personal. Whatever the case may be, the psyche seems to personify its contents. One need only recall an elaborate dream to recognize that each dream character display unique personal and typological traits. Figure 3. Archetype Double Quaternity. Beebe’s model seems to imply that type development actually unfolds in a zigzag pattern comprised of movement between the spines and arms of the type model. Viewed in three dimensions, the zigzag pattern would look like a descending spiral. Jung (1951/1959) adopted a similar schema in regards to the structure and dynamics of the self, in chapter 14 of Aion (CW9ii, para. 390). There he lays out a series of syzygies that culminate in a four-fold structure of the self: Jung writes: “When psychic contents are split up into four aspects, it means that they have been subjected to discrimination by the four orienting functions of consciousness” (CW9ii, para. 410). Because of the way Beebe’s model is constructed, one could infer a dynamic and holistic process in the form of double quaternity (Figure 3), which effectively models the structure and dynamics of the whole personality. The development of the types proceeds in lockstep with the individuation of the personality and typically adheres to a certain psychological narrative. 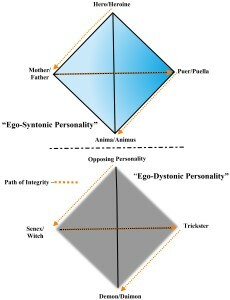 The broken zigzag line depicted in figure 3 could be viewed as a path toward psychological integrity. This jagged course through the functions is consistent with his supposition that one “cannot get directly to the inferior function from the superior, it must always be via the auxiliary function” (1989/2012, p. 75). 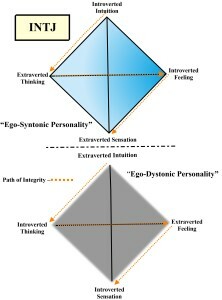 Thus, if one were an INTJ—introverted intuition, extraverted thinking, introverted feeling, extraverted sensation—his or her path toward integrity could be depicted accordingly (Figure 4). The doorway to the unconscious is found at the fourth archetype with is colored by extraverted sensation. 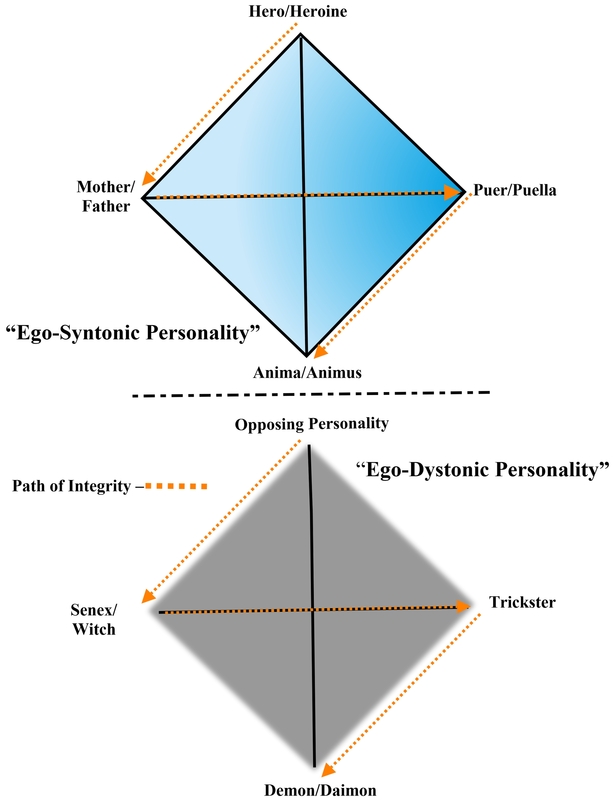 Once the person successfully maneuvers the ego-syntonic quaternity, a coniunctio oppositorum seems to take place at the fourth archetypal stage, which promotes greater psychological integrity within the personality. With the inferior function overcome—the doorway to the unconscious— the person reaches threshold of his ego-dystonic personality and encounters the fifth function, which assumes the role of the opposing personality. As in the first quaternity, the individual explores his psychic interior until achieving a second coniunctio by uniting the sixth archetype with the seventh one. Such an undertaking usually requires a reconciling symbol that will unite one function-attitude with another resulting in the transcendent function. The path of integrity is another term for individuation and could be viewed as a circumambulation of the personality whose aim is wholeness. For additional information, click here to download an insightful article written by Dr. Beebe about the Eight-Function Model. Beebe, J. (1992). Integrity in depth. College Station, TX: Texas A&M University Press.